I landed my first SEO client in 2001. Back then, companies were excited about the opportunity to compete on a national level. It started in 2007, when Apple released the first affordable consumer smartphone. Within four years, iPhone ownership would soar from just over 1 million to 72.3 million. In that same time period, local searches grew from 1 billion per month to 3.45 billion. Coincidence? I think not. According to Google, 20% of desktop searches have a local intent. But on mobile devices, it jumps to 50%. The smartphone has become mainstream, leading to the explosive growth of what’s known as local search. Local search is the online version of anything you’d look up in the phone book. It’s when someone searches for a business, product or service within a specific geographical area — like pizza uptown manhattan. There are over 200 ranking factors in local SEO. But here are the key components of a successful strategy. On-page optimization is the foundation of both national and local SEO. In local SEO, however, location is also a keyword. The product/service keyword plus the city and state should be placed in the title, h1 tag, description, URL and page content. This means you have less real estate in your title tags — especially now that Google uses pixels rather than character count to decide when the text cuts off. Local SEO experts also feel that adding schema markup can help boost your rankings. Only companies with a local presence appear in this section. That’s why a properly optimized Google local profile is one of the most important ranking factors in local search. Unfortunately, Google has changed and re-branded their local listings so many times that even the experts are frustrated and confused. Google Places Google+ Local Google My Business is a listing and profile page of every business and organization in the world. Business owners can claim the listing to gain access, or create a new one. Once claimed, you can add information, like hours of operation, business categories, and even a cover photo. At the time of this writing, Google is in the process of merging all original Places pages into the Google+ platform. This adds a “social layer” that the original local pages did not have — the ability to post updates and interact with people in a Facebook-like manner. For the nuts-and-bolts of optimizing a Google profile, Phil Rozek’s Local Search Visibility Guide is an invaluable resource. At nearly 68%, Google leads the pack in overall search market share. But not so much with local search. While still a major player, the local search space is more fragmented, and rife with competition from local directories and Internet Yellow Pages (IYP). What’s more, roughly half of mobile local search occurs in apps. While Google Maps is the most popular, Yahoo, Mapquest, Bing, Yellowbook, Yelp, Superpages and Apple Maps have over half of the app market share. Which is why it’s important to get listed on these types of sites. This occurs through citations. A citation is any mention of your business name, address and phone number (NAP) on another website, even if there’s no link. This could be a business listing on Yelp, YP.com or the Better Business Bureau. Citations are local SEO’s equivalent of a backlink. Search engines pay attention to listings on authoritative directories like these. The more you have, the more confident Google and the other search engines are that your business actually exists and that the information they are providing is accurate. The only thing worse than no citations is inconsistent citations. It’s important that your NAP is consistent across your website, social media profile, and online directories. It’s worth noting that these hundreds of local directories don’t create their own data. They obtain it from major data suppliers like Infogroup, Localeze, and Acxiom. A shortcut to manual citation-building is submitting your business information (for a fee, of course) to these providers. Besides the major online directories, look for opportunities to build citations on both locally relevant and industry-relevant domains. An example of a locally relevant citation would be a listing on a local chamber of commerce. This is a “trust” signal. It tells Google your business location is relevant to the search query. For industry-relevant citations, seek out sites recognized as authorities within a particularly category or niche. Sites like avvo.com and justai.com are examples of where an attorney would want to be listed. Being listed with other businesses in the same category tells the search engines that are indeed are a plumber, attorney, or landscaper. 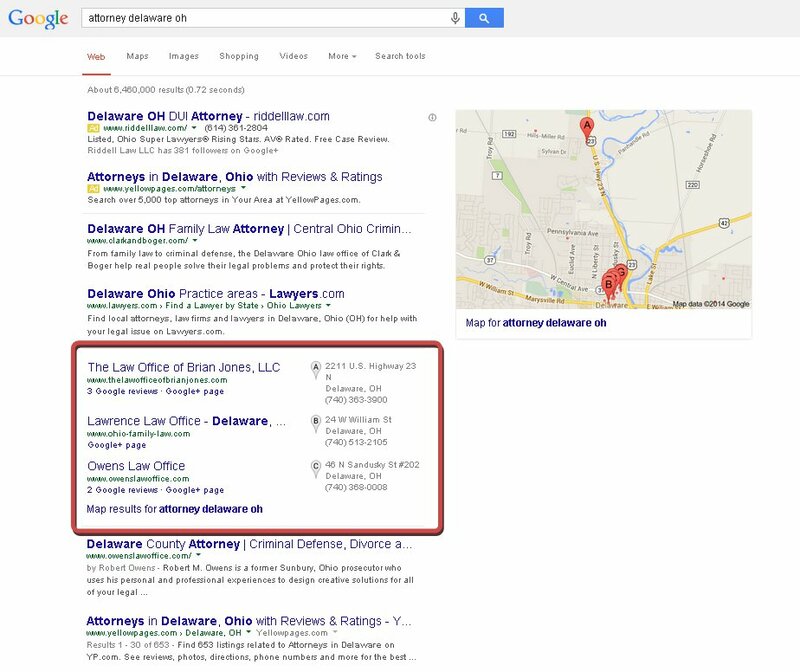 This tells Google your business category is relevant to the search query. For this reason, you shouldn’t overlook Internet Yellow Pages sites where you get both a locally relevant and industry-relevant citation. Google’s recent “Pigeon” update has provided a traffic upswing for Internet Yellow Pages (IYPs) and directory sites. A mobile website doesn’t help you rank any higher in regular search results. But sites that aren’t mobile-friendly or are configured incorrectly won’t rank well in Google’s mobile search results. Even if your non-mobile site does get found in a mobile search, 61% will abandon it. There are two methods of creating mobile websites: responsive design and parallel mobile. Responsive Design is a flexible layout that automatically “responds” (i.e., resizes) to the screen size of the device being used. Parallel Mobile involves creating a duplicate mobile website. Rather than www.example.com, mobile visitors are redirected to m.example.com. The parallel mobile method means multiple sites have to be updated; whereas, a responsive website is a single site. Responsive web design takes more time and requires a higher level of expertise, which can increase costs. For companies with an existing non-mobile site, implementing a responsive design means building a brand new site. Creating a parallel mobile site is faster and less disruptive to the organization. Google may regard a parallel mobile site as duplicate content, so you’ll need to insert some html code in each webpage to prevent this from happening. Needless to say, a mobile-friendly website is crucial as local search is nearly synonymous with mobile search. I consider the items listed above to be “the cost of entry” — like a business card. If you don’t have one, why be in business at all? Companies who want a leg-up on the competition must do more than the bare necessities. In Part 2, I’ll discuss the other components of a successful local SEO strategy.